Zinnovate has teamed up with the Network of Independent CargoWise Experts, or NICE, to deploy elite-level expertise for WiseTech Global’s leading software anywhere in the world. NICE boasts experienced product managers and engineers on every continent. We’re present in some 25 countries on all continents. It is truly a synergetic network. The launch issue of Digital Bulletin delves straight into the forces powering the Fourth Industrial Revolution. 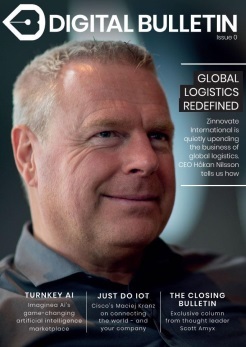 Among a broad collection of features is our opening case study on Zinnovate International and its CEO Håkan Nilsson, our first cover star. Håkan Nilsson, CEO of Zinnovate International, and Hans van der Zwet, founder of NICE (The Network of Independent CargoWise Experts), on Zinnovate's global grid of elite practitioners in the logistics industry.